I’m studying at the Andijan Agricultural Institute, the Faculty of Economics. Due to the days of mourning, classes began on September 4th. On September 8th, our curator said that starting September 10th we all will go and pick cotton. I rested a day at home, but more like gathered my things for the departure. 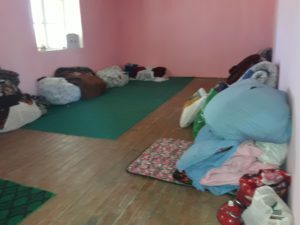 I took my bed, bedsheets, clothes and food. Had to buy few things to wear though. Besides I took 10 pieces of flat bread, sugar, butter, condensed milk, biscuits, gingerbread and medicines. 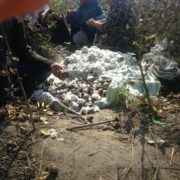 I spent 600 thousand Uzbek Sums ($95) to buy food and clothing needed for cotton-picking. Two warm trousers cost me 50 thousand Uzbek Sums. I also bought 8 warm socks, jacket, jumper, slippers, and underwear. My relatives will need another 600 thousand Sums to visit me while I am gone for cotton picking. 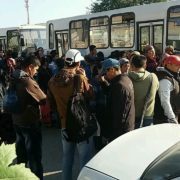 We were ordered to gather near the Institute at 6am on September 10th. Having spent 20 thousand Sums for the road expenses, I arrived at 6.30am. My uncle helped me get to the destination. At 9 am our column set off towards the area called Sawai of Kurgantepa district. We were accommodated in local school. There were approximately 2000 students from my institute. We were placed in different schools though. At the school where we were placed, were mainly our classmates from the same year. It was two-story school. Boys were placed at the gym and those who did not get a corner in the gym were placed in the corridors and in the lobby. Girls were placed in classrooms on the first and second floors. Rooms were emptied before we arrived. Only blackboards were left. Despite the fact that the beginning of the school year was close, classrooms were not repaired and looked pretty old. There were holes in the walls and the wind blowing through them. This year the weather is a little bit cold. No matter how sunny the day is, there was cold wind blowing. So glad I took warm clothes with me. But my feet are still cold. Mom told me to take makhsi (national leather shoes), but I was too shy to do so. Many girls wear makhsi over here. I took overshoes, slippers and sneakers. When I leave for picking cotton, especially in the mornings and evenings, my feet get cold. My aunt, also student earned rheumatism 2 or 3 years ago during the cotton harvest. She fainted during the cotton harvest. Local doctors kept her at the hospital until midnight. Then a friend of my aunt secretly called her mother at home. They arrived immediately and called the ambulance. My aunt had a surgery the same day. She had an intestines’ obstruction. Parents of my aunt spent a lot of money on her treatment back then. There was a lot of noise in the institute. I am scared and so I am wearing warm clothes. It has been a week since we are here. Every day, we collect 50-60 kg of cotton. What we earn covers only food expenses. At school where we live, there are almost no conditions. There is always a line to go to the bathroom. There are two toilets for boys and two for girls. No shower though. 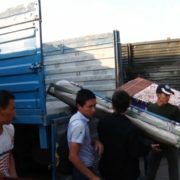 There is a long piece of steel tube. There are 3-4 holes in it for water to come out. We wash our faces and hands by 3-4 people standing in a row next to the tube. The water is cold. In the mornings in the courtyard in the samovar there is boiled water for tea. When we run out of boiled water, there is nothing left but to drink cold water. Everyone eats their own bread and as we drink tea. By the way, in the Khait days we were given bread twice. It is good I took sugar and butter. We share with friends and eat. Some girls did not bring any food with them. They probably did not know. There are 14 girls in every room. All split into 2-3 teams and eat. We wake up at 5 am. By the time we have breakfast and brush teeth it is already 6.30 am. Then they bring us to the cotton field. They take us by bus when it is far or we walk when it’s close. We have lunch right in the field at 1pm. We weight what we collected before 12 pm. Then we have a lunch. Sometimes we are given mastava (rice soup) or pasta. We had pilaf in Khait days. Once they made “dimlama” (fried). There was mainly pumpkin in the “dimlama”. Due to the fact that I do not like pumpkin, I could not have “dimlama”. Returning from the cotton picking back to dorm I bought cookies at the local shop. Mom left 50 thousand Sums in cash for minor expenses. In the evening at 6 pm we leave the field and weigh harvested cotton. Dinner takes place in the field again. For the dinner we are normally given watery soup. We are girls, but the boys stay hungry after the dinner. Not everyone has enough food. After such an awful food we head off back to dorm for get some sleep. They boil water in samovar again. Generally it is boiled to wash our hands, but we make tea and eat our supplies. Then we go to bed. 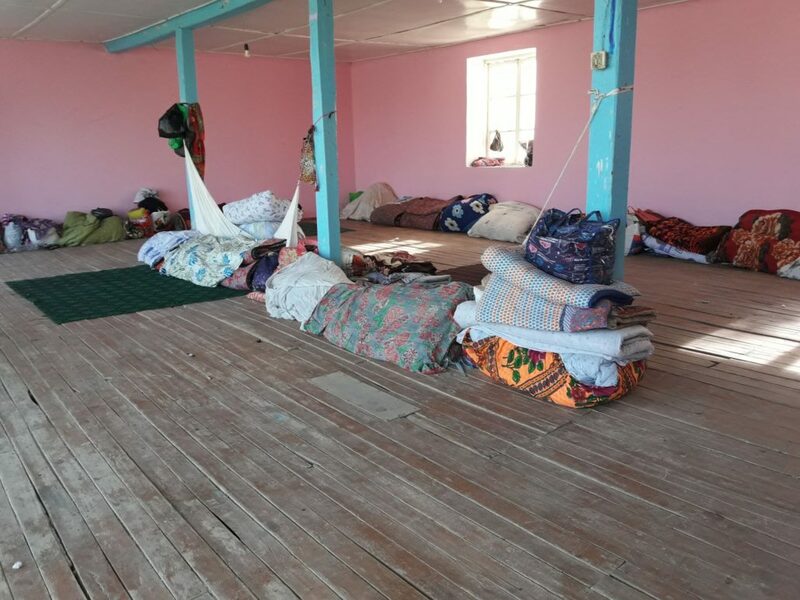 The school building is bad because when we need to go to the bathroom during the night, we have no other way but to pass through sleeping boys. They sleep undressed. We are ashamed. We are not so close with each other. As senior year students said conditions were better last year. 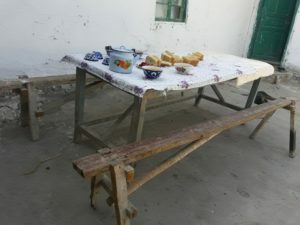 Students were given breakfasts and dinners in the sleeping area. 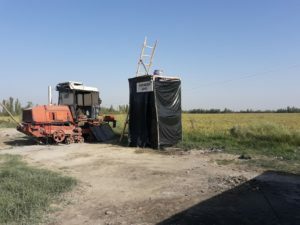 They said: – “This year there is no the president of the state anymore … That’s why it is so different.” We have not been paid for harvested cotton yet. Every day we pay for food that we eat. Can’t believe we will keep suffering? It would be better not to come. We have 5-6 people who did not come to the cotton. They paid $300 each. One of them is Khakim’s nephew. He did not pay for as far as I know. He shared this info with our girls. Our rates are slightly less expensive. My friend studies at the medical institute. 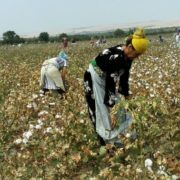 Administration did not agree to release from cotton picking even for $400. She was asked to pay $500. Now she is picking cotton in Ulugnor district. They said, cotton picking will last for a month only. Whether I am here on my own will? I would never in my life pick cotton. Those who do not show up to pick cotton, especially freshmen, quickly expelled from studies through fake reasoning such as failing to pay tuition fees. Senior year students suggested picking cotton slowly, just formally. I am thinking whether I should tell my father. I cannot stay here anymore. What will I do if I get ill here? Father is coming back from Kazakhstan in the end of the year. Money that he earned there will be spent to renovate our house and to pay for my studies. Besides that, money is needed to feed me and my brothers until spring. I am thinking if I should take $300 and pay for cotton. But it would mean that I am taking my brothers’ share. I have no strength left. You work like a slave from morning till night, not enough food, and should sleep and wake up hungry again. Feeling homesick. Other girls say the same. Tomorrow mom and uncle will come visit me. Even though I call them every day, I still miss them. When mom asked me what to cook and bring, I said 3-4 meals. I know I asked too much from my mother, but I am starving here. Sometimes I think “God when this is over!” If mom comes two more times to visit me, it will come to $300 in total. Would be better if she didn’t come. I am not sure if I will be paid for the collected cotton. And the cotton is not good; not a lot of cotton actually. I overheard a conversation between two farmers. 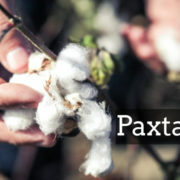 Cotton was exposed to insects and was harmed in the summer. May God grant patience to the end of cotton!!! Taking baths? They say will bring us there tomorrow. After lunch, we leave cotton not at 6 pm, but at 5 pm. Only girls will be taken to baths. Boys will go another day. Will also wash our clothes. Good that I took the soap and washing powder. I have spent 18 thousand out of 50 that my mom gave me. I do not know how much they pay per kg. They said 250 Sum per kg. Some boys do not collect. Others collect on their behalf. A boy named Abbos from our course, said that he buys 50 kg of cotton for 16 thousand sum. We have some students who pick cotton well, especially girls. There are 7-8 of them. They collect up to 100 kg. But for 5 days they were paid only 30 thousand to 40 thousand Sums. We were surprised. They were to receive 200 thousand. Then they said the money was deducted because of the meals. Since I collect a little, they said will deduct from my first semester’s stipend. Eh, let this cotton be over, let’s wait and see! Name of the student is not disclosed at her request.